Groups are used to create a smaller subset of students. The subset can then be used in billing and email blasts. In general, you would create a group when you want to target a students for a specific reason. For example, competition teams. 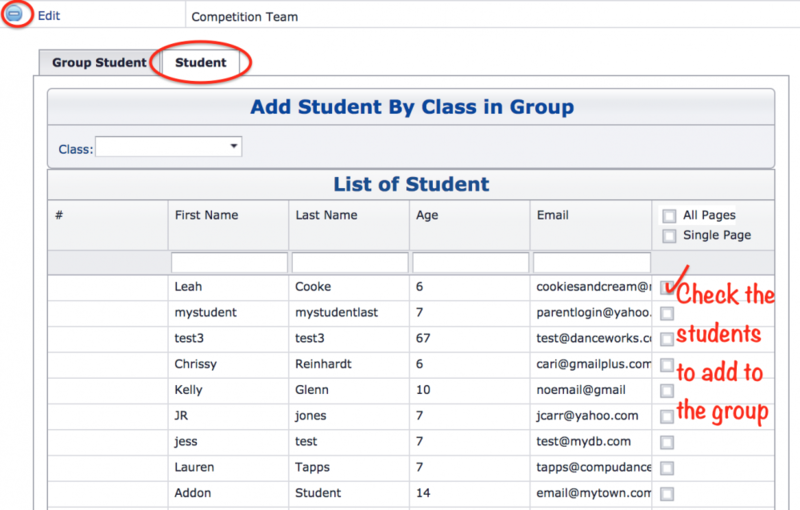 By making a group for competition teams, you can direct emails that pertain only to them. Likewise, you can batch bill them for specific items such as competition fees. To create a group go to ADMIN Menu and select School Setting Types from left side menu. Select the School Groups tab. Click Add New Group button. Click the plus sign on the group and go to the Student Tab (2nd tab). A list of all students will be displayed. Click the checkbox on those to be included in the group. Click the plus in front of the group you wish to see the details for. The first tab lists all students currently in the group. To remove one, click Drop on the student’s line.